Are you ready for the next level of Availability for the Modern Data Center™? Join us for a webinar on how you can get superior backup performance with more backup storage integration for deduplication appliances with HP, EMC, and other deduplication appliance vendors. 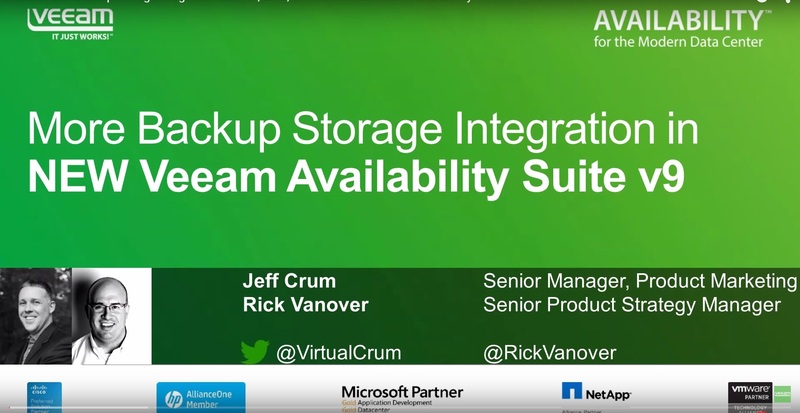 These features and more are coming soon in the NEW Veeam® Availability Suite™ v9. New HP StoreOnce Catalyst integration: Superior source-side data deduplication to enhance backup performance, reduce backup costs and simplify the backup environment. Updated EMC Data Domain support: Enables source-side deduplication and data in-flight encryption over the WAN for faster, more secure backups to offsite EMC Data Domain appliances. New features for high-performance backups with ANY deduplication appliance: Get up to 10x faster backup performance, improve local backup copy performance and reduce the load on deduplication appliances.